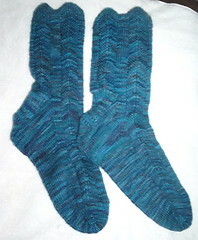 Nicole's Needlework: I finished my Sockapal-two-za socks! I bought two skeins of Koigu for them, but they ended up only taking two. The weird thing is I used more than one for the first one, but used less than one for the 2nd, and they are the same size. Oh well, at least I know I'll only need two skeins if I do decide to make another. I took a picture of them on my feet, but I couldn't get my camera to upload them. Oh well, I'll try again tomorrow! Well, I'd better get going.. have to wake up at 4:30 am. Fun, fun! I love them! I am trying to work on a pair myself as there is nothing like hand knitted socks in my opinion. mmmmmmm, Koigu. Those are really nice socks ... lucky sock pal!